I almost forgot these were performers and not actual beings that had crawled out from the pits of Japanese hell as they stomped around menacingly. Cymbals crashed and frantic drums filled the room, my heartbeat speeding up to match the rhythm. 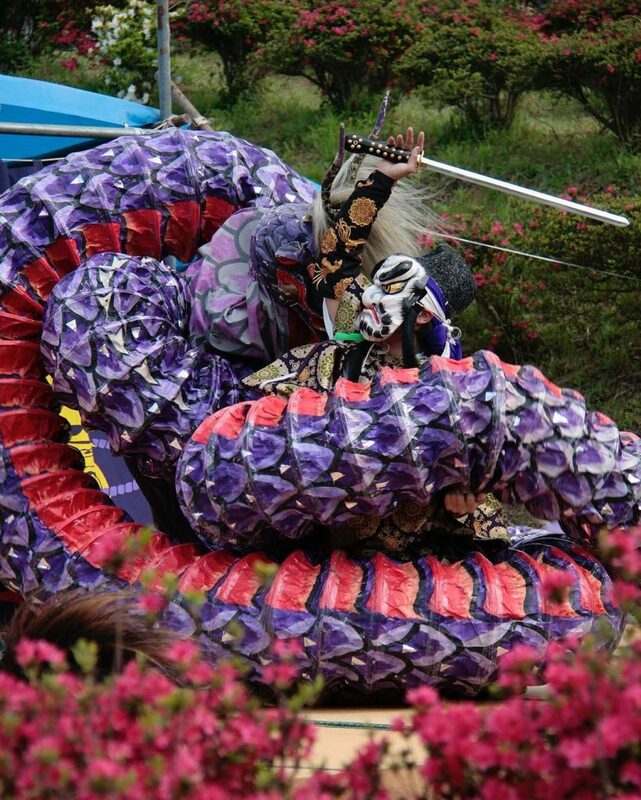 But they are indeed performers – three men performing a traditional demon dance, Iwami Kagura to be exact. I had the pleasure of witnessing this killer local performance art while visiting Oda, Shimane Prefecture. A local group based in the little known prefecture, next to Hiroshima, was gracious enough to let us sit in on their practice. If going to a Kabuki performance is like putting on your best suit and heading to the opera, attending Kagura feels like watching live action Lord of the Rings in a leather jacket. Watching the performers twirl around each other in a frenzy for 40 minutes straight during a fight reminiscent of an aggressive ballet made me dizzy, and I wondered how they could handle it. They removed their oversized hannya (horned female demon) masks at the end to reveal faces dripping with sweat. 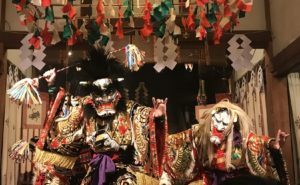 Many of us who are interested in Japanese culture are familiar with Kabuki and Noh – we’ve at least heard of them. The extravagant wigs and stark white faces painted with distinctive red lines that characterize kabuki are an image easily associated with Japan. Kagura remains relatively unknown both inside and outside of the country. You’ll have to travel off the beaten track to get a glimpse of Kagura.